Chaplain Fr. 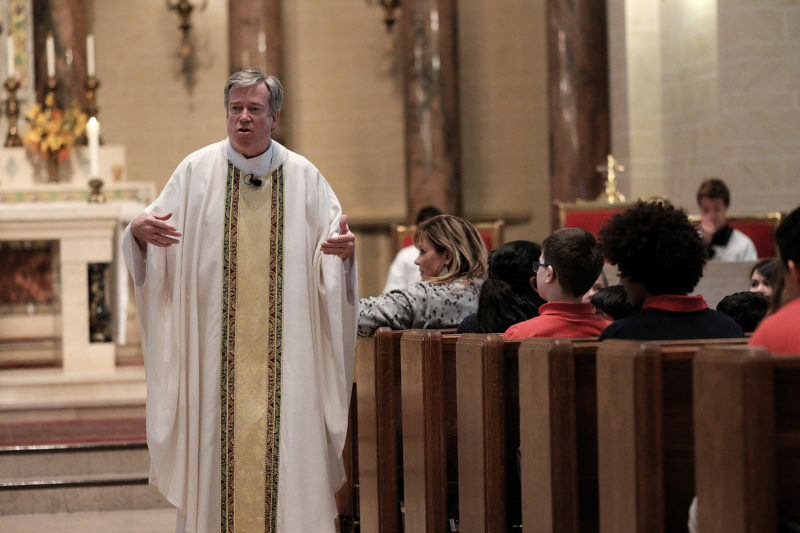 Kevin Finnegan celebrates mass with the scholars once a week. We are Roman Catholic in our identity, and we welcome everyone, regardless of faith tradition. Catholic education in America has a rich history, and we are proud to be able to continue the tradition with a spirit of justice and generosity toward all of God’s beloved children. It is part of the mission of St. John Paul II School to create saints with a Christ-centered education. Prayer is regularly practiced in our classrooms, as we ask for the wisdom and strength to do God’s will and to be our best selves. Every week, our scholars attend mass at Holy Cross Church. Scholars are taught to pray the rosary and join once a month to pray it together. Also, as our school and neighborhood welcome more Latino families, Our Lady of Guadalupe has taken on special meaning for JPII. Every December we honor her feast day with a special mass and meal, wrapped in Catholic traditions and Latino heritage. St. John Paul II was born Karol Wojtyla near Krakow, Poland, in 1920. After helping Jews avoid concentration camps during the German occupation of World War II, he became a priest. For several years Wojtyla served as a cardinal and the Archbishop of Krakow; in 1978 he was elected pope and took the name of John Paul II, after his predecessor. As pope, John Paul II was known for encouraging the ministry of the world’s children, holding the first annual World Youth Day in 1985. He also had a special devotion to Mary, the mother of Christ, and promoted the rosary as a regular practice for all Catholics. John Paul II was the Church’s first truly mobile pope, visiting more than 120 countries and forming close connections with leaders of other faiths. Nine years after his death, in 2014, Pope Francis completed the process of declaring John Paul II a saint. You can find his likeness in many places in our school as a model of humility and faithfulness. We are proud to relate his legacy to Northeast Minneapolis’s Polish heritage. A popular song among scholars is “Serdeczna Matko,” a Polish hymn honoring St. Mary. St. John Paul II, pray for us!